Need not be present to win. 2500 tickets available. Not a charitable donation. Total of prizes valued at $12,000.00. Items will be on the premises for the drawing on January 1, 2019. Raffle winner must qualify for all federal and state regulations to take possession of firearm on the next business day. Firearms winners must be 21 or older. 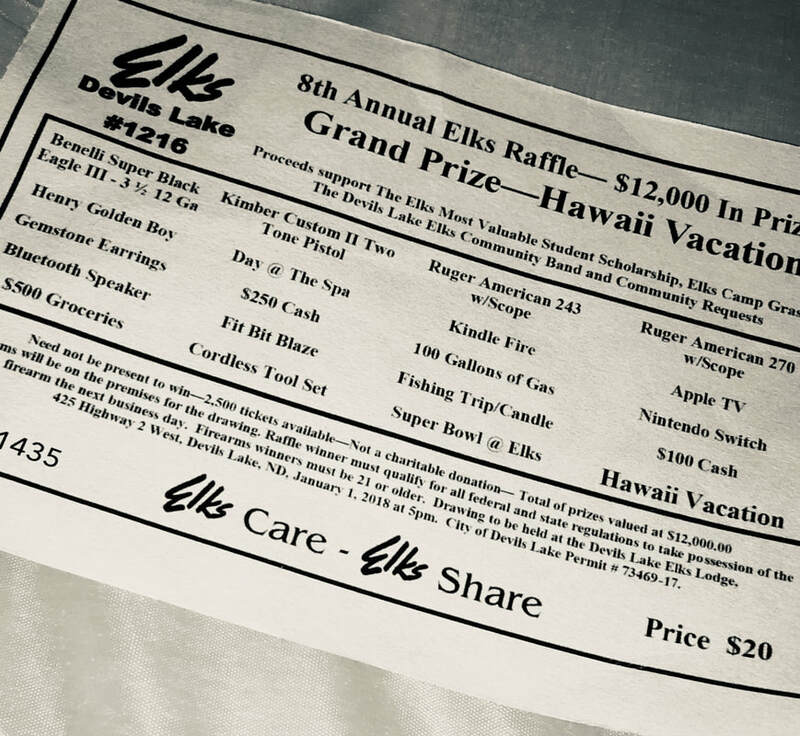 Drawing to be held at the Devils Lake Elks Lodge located at 425 Highway 2 West in Devils Lake, North Dakota on January 1, 2019 at 5:00 p.m.
​support special projects throughout the Lake Region. To apply for the server position at the Elks 1216 Club, please click to download the application file. ​If you have issues downloading or printing the application, paper applications can be picked up at Swenseth Law Office (located downtown Devils Lake in the 20/20 Eye Clinic at 211 Fourth Street NE), or call 701-662-5058 and state you are calling regarding this posting. Completed applications can be dropped off at the Elks Club between the hours of 4pm-8pm (Tuesday through Saturday), or at Swenseth Law Office, during regular business hours (Monday through Friday).